House of Fun is a 5-reel, 30 payline video pokie offered at top Betsoft Casinos. 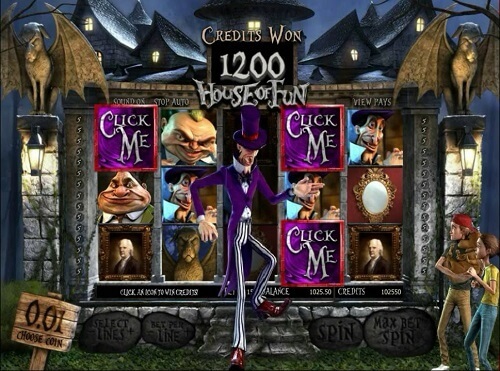 This slot machine has three rows and a haunted house, with monsters all across the reels. Ironically, the two children who stumble across this house do not have fun. Luckily, Aussie players can when they take a few spins on this low stakes pokie. The spooky theme, and the expected Betsoft 3D style, of the game make it more fun than other Halloween games. Of course, you don’t have to take our word for it! Symbols in House of Fun vary from rusty door knobs to Jack in the Boxes. There are also Mad Hatters, vampires, creepy portraits, gargoyles and a Cheshire cat. Landing three Jacks will trigger the Jack Free Spins feature. In this feature, the centre reel expands and goes wild. Free Spins will vary, but they do pay out. The next exciting feature is the Mad Click Me. To activate the feature, players must land three Mad Hatters. Once active, all AU gamblers need to do is keep clicking for bonuses until ‘Collect’ appears on the reels. Added to these features is the Escape bonus game. This bonus is activated when three door knobs fall over the reels. In the Escape game mode, Aussies will need to help the children escape from the house. Other symbols will pay out small amounts throughout the game. This chilling experience is sure to keep gamblers coming back for more. We liked the adventure, and the bonus features were thrilling. However, the payouts were a little small. While the game is exciting, it does require a Flash player to work. So, keep yours updated to ensure that you can visit the House of Fun at our top Betsoft casinos.